...that the Drifter is an associate of the Shadows of Yor? Shock Servitors are unique Splicer Servitors that appear in during the Aksis, Archon Prime encounter in the Wrath of the Machine Raid. 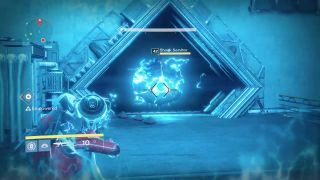 Shock Servitors must be killed to both prevent Aksis from initiating a critical SIVA density and to pick up the SIVA Charges that they drop in order to start the damage phase. They can only be destroyed by a Shock Cannon.